Your toilet works just fine. It’s served you well over the years, flushing with power and precision year after year. However, time can age a toilet—and much like an old man growing crow’s feet and liver spots, your toilet will show signs of age in the form of hard water stains, discoloration, and rust. This isn’t the end for your toilet. In this blog, the Honolulu plumbers at Emergency Plumbing & Solar will give you a few tips for cleaning up your toilet so it looks as good as it flushes. There are thousands of blogs (just like this one) that will give you tips on how to clean a toilet, but most of these blogs will claim to have the inside scoop on the very best toilet cleaner. We hate to break it to you, but there isn’t one. Not all toilet stains are one and the same—they’re made of different organic and inorganic materials. What works for one toilet might not work at all for another. Keeping this in mind, we’ll give you a list of cleaning solutions that might just have the magic touch when it comes to toilet stains. Bleach is the biggest and worst of all standard household cleaners—and it can do some major damage to stains in your toilet bowl. We’d recommend a bleach powder for this job—just pour some powder right into the bowl, let it eat away at the stains in your toilet overnight, flush it down in the morning, and give your bowl a good scrub to polish things up. For those who aren’t fans of bleach stinging the nostrils, baking soda and vinegar could be the sneaky killers you need to remove toilet stains. Pour a half-cup of baking soda in the bowl first, and add a liberal amount of vinegar next. Let the mixture effervesce for 20-30 minutes, then give it a scrub and flush away the evidence. Borax sounds like the cheesy name of a powerful chemical cleaning product, but it’s actually a natural mineral formally known as sodium borate (a compound of the boron family). Teamed up with some vinegar, borax could be just the right cleaner for your stubborn stains. First, add a half-cup of vinegar to the bowl, and let it sit for about an hour. 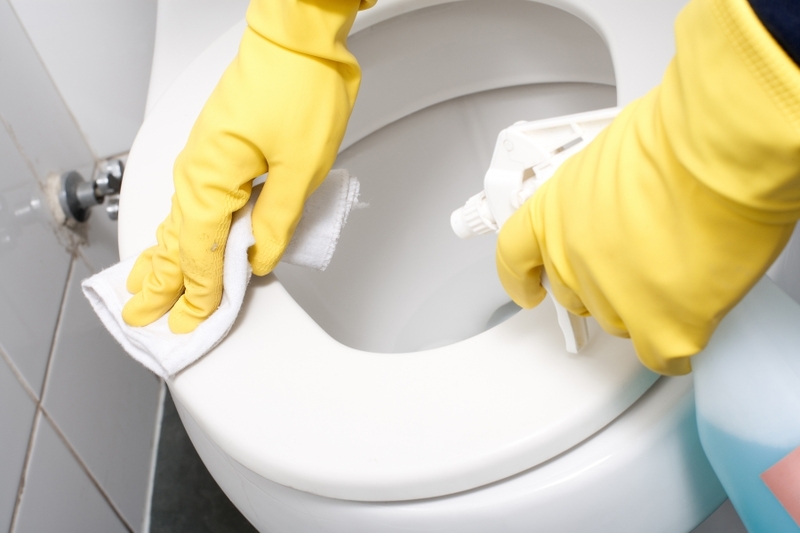 Once that hour is over, give your toilet a light scrub with a toilet brush before flushing the vinegar down. Next, add a half-cup of borax to the toilet bowl, stir it around a bit, and let it sit overnight. In the morning, put your back into it and scrub your stains away for good. A little Coke can go a long way—all those sugars and fizz and other things you probably shouldn’t put in your body can do an excellent job of lifting stains. It’s simple: Pour a bottle of coke in the toilet, let it sit for a few hours, flush, and scrub to remove stains. Now that’s refreshing. Yeah, we said it! If you would’ve cleaned your toilet once a week, you wouldn’t be pouring your precious Coke in the toilet or buying bleach by the bucket. Good thing Emergency Plumbing & Solar is here to give you toilet cleaning tips and provide you with the best Honolulu plumbing services. Removing Toilet Stains Overall rating: 5 out of 5 based on 10 reviews.